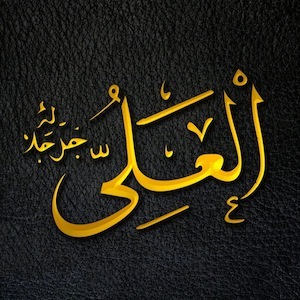 God's Name Al-`Aliyy is from the root ‘a-l-w (و – ل – ع) which means ‘to be high and exalted’. When we prostrate to Him, we are at our physically lowest point, but we are praising He who is far elevated above everything. We say: “How Perfect is my Lord, Al-A`lā [the Highest]” The Prophet (pbuh) reminds us that “My ummah (community) on that day [the Day of Judgment] will surely have bright faces because of sujood […]” (Ahmad) When you know that God is the Most High, we cannot but be in awe of Him. naturally when we view something as great, our natural inclination is to elevate it, desire it and even emulate it. So knowing that God is the Most High prevents us from elevating things to a higher degree than they are, and prevents us from being deceived by worldly standards.